The Wall is a rock opera and concept album by Pink Floyd. Hailed by critics and fans as one of Pink Floyd's best albums (along with Dark Side of the Moon, Wish You Were Here, and Animals), the album is known as a rock and roll classic, and its morbid, depressing anthems have inspired many contemporary rock musicians. This was the last studio Pink Floyd album to feature Richard Wright until his return in 1987. Roger Waters was inspired to create the album during a 1977 concert tour for Animals, dubbed Pink Floyd — In the Flesh. In Montreal, a fan's disruptive behaviour resulted in Waters spitting in the fan's face. Waters was immediately disgusted with himself, and his alienation from his fans urged him to build a wall between himself and the audience, an idea which later evolved into the album. All of the songs were penned by Roger Waters with the exceptions of "Young Lust", "Comfortably Numb" and "Run Like Hell," which were co-written with David Gilmour, and "The Trial", which was co-written with Bob Ezrin. The album has been certified 23 times platinum and hit #1 on the Billboard Album Charts in 1980. Originally released on Columbia Records in the US and Harvest Records in the UK, The Wall was then re-released as a digitally remastered CD in 1994 in the UK on EMI. Columbia issued the remastered CD in 1997 in the US and rest of the world. For The Wall's 20th Anniversary in early 2000, Capitol Records in the US and EMI for the rest of the world re-released the 1997 remastered CD. In 1998 Q magazine readers voted The Wall the 65th greatest album of all time and in a similar poll in 2003, Rolling Stone magazine readers named it the 87th greatest album of all time. The album's concept and most of the songs are by Waters. The storyline portrays the fictional life of an anti-hero named Pink Floyd, who is hammered and beaten down by society from the earliest days of his life: having lost his father (killed in Anzio during World War II, as was Waters' own), smothered by his over-protective mother, and oppressed at school by tyrannical, abusive teachers who tried to mold him and the other pupils into the "right" shape for society. Pink withdraws into his own fantasy world, building an imaginary wall to isolate himself from the rest of the world. Every bad experience in his life is a brick in that wall. The first few bricks are made from the pain of his father's death, abusive teachers, and over-protective mother. After heavily contemplating how to fill in the last few empty spaces in the wall, Pink puts off the construction of the wall for a while. He becomes a rock star and gets married (although not to Vera Lynn, as some may think - she was an entertainer in the Second World War), only to be cheated on by his wife due to his distance and coldness, as well as the life as a rock star. After this he resumes building the wall and it is completed. Pink slowly goes insane behind his freshly completed wall. He is lost on the inside, but is forced to surface by his demanding lifestyle, and I.V. drug use distributed by his crew to "Keep him going through the show." This may be a reference to the drug abuse by Syd Barrett in the earlier days of Pink Floyd. Hallucinating, Pink believes that he is a fascist dictator, and his concerts are like Neo-Nazi rallies where he sets his men on fans he considers unworthy, only to have his conscience rebel at this and put himself on trial, his inner judge ordering him to tear down his wall in order to open himself to the outside world. At this point the album's end runs into its beginning with the closing words "Isn't this where……. "; the first song on the album, In the Flesh?, begins with the words "…..we came in?" hinting at the repetitiveness of Waters' theme. During recording, Richard Wright was fired from the band but stayed on to finish the album and perform the live concerts as a paid musician. According to co-producer/engineer James Guthrie, he played on more than half of the album. The album was recorded at four studios. One in New York (CBS Studios), one in Los Angeles (Producers Workshop) which was also where the album was mixed) and two in the south of France(Super Bear and Miravel). The studio changes were the results of tax problems and in fact financial considerations dictated the way the album was made. The band's then-agents Norton Warburg ran off with the millions that the band had earned between 1973 and 1977 and left the band near bankruptcy and had to record The Wall in France. Toni Tennille, of Captain & Tennille, contributed to the song One of My Turns, speaking the part of a groupie who is invited back to Pink's trailer. 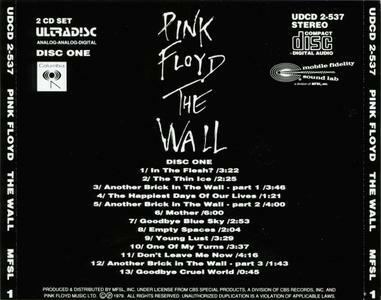 Around the world, the album produced a number of hit singles for Pink Floyd, including "Another Brick In The Wall (Part 2)", "Young Lust", "Hey You", "Comfortably Numb" and "Run Like Hell". For "Another Brick in the Wall (Part II)", Pink Floyd needed a school choir, and approached music teacher Alun Renshaw of Islington Green School, around the corner from their Britannia Row Studios, in the middle of a lesson. The choir were not allowed to hear the rest of the song after singing the chorus, and were let down, as they wanted to hear Gilmour's solo. The chorus was overdubbed 12 times to give the impression that the choir was larger. Though the school received a lump sum payment of £ 1000, there was no contractual arrangement for royalties. Under 1996 UK copyright law, they became eligible, and after choir members were tracked down by royalties agent Peter Rowan of RBL Music, through the website Friends Reunited, they sued. Music industry professionals estimated that each student would be owed around £ 500. Pink Floyd performed the concert version of The Wall only a handful of times, in New York, Los Angeles, London, and Dortmund. This was due to the grandiosity of the performance, which involved constructing a giant wall across the stage between band and audience, not to mention staple Pink Floyd props such as giant screens, flying pigs and pyrotechnics. The performances began with a "surrogate band" performing In the Flesh? composed of Andy Brown on bass (and miming Roger Waters who was singing on main stage), Snowy White on guitar, Willie Wilson on drums and Peter Wood on keyboards. The surrogate band wore masks of the faces of their counterparts in the real band whilst the real band were on the main stage in the dark. Then, a plane crashes and the "surrogate band" stops and freezes and the small stage sinks and the real Pink Floyd come in full view, and a giant wall was constructed by roadies out of 420 cardboard bricks throughout the first half of the performance augmented by appearances by an inflatable teacher, wife and mother. In the second half, the band would be completely obscured from view behind the wall, but still playing. Roger Waters sang from an open hotel room on "Nobody Home". Then on "Comfortably Numb", Roger Waters sang his parts dressed as the doctor wearing a white coat in front of the wall while guitarist David Gilmour was hoisted hydraulically on to the top of the wall singing his parts and playing his famous guitar solos in full view of the crowd. Then, the surrogate band had on deathmasks of the four band members and the four Pink Floyd members all wore Hammer shirts, jeans and shoes (Gilmour, Mason and Wright) except for Roger Waters who wore a long leather trenchcoat with hammer logos and storm-trooper boots. The wall was eventually torn down during "The Trial", and Pink Floyd themselves joined the surrogate band in front of the wreckage of the wall to perform the finale, "Outside The Wall". During the performance, giant puppets of the characters Teacher, Wife and Mother, designed by Gerald Scarfe, were used, and animations by Scarfe were projected onto a circular area and onto the wall itself. Added to this, a hotel room (where much of the story is set) emerges from the wall midway through the second half for Nobody Home. The large stage shows required huge equipment (including full sized cranes), and cost an extraordinary amount of money to realize. As such, the band lost money from them, with the exception of Wright, who was retained on a fixed salary for the concerts after being fired during the production of the album. The intent of the band for these concerts was to give the audience a truly theatrical experience instead of just a show where the band played the songs. As such, during many songs, Waters assumed the role of the anti-hero, "Pink", singing despondently from a hotel room (a set on the stage). To this day, these performances are considered some of the greatest rock concerts ever. In 2000, the best performances from these concerts were compiled into a live version of the album called Is There Anybody Out There? The Wall Live 1980-81. The release includes two tracks not on the studio album ("What Shall We Do Now" and "The Last Few Bricks"). 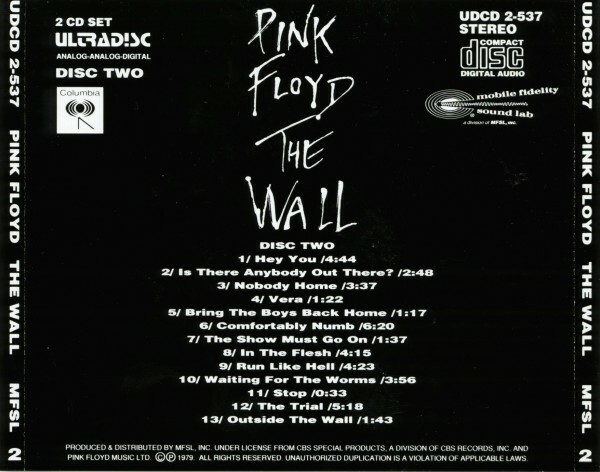 The former was left off the studio release due to space constraints, and the latter was a medley of the first half of the show to let the roadies finish building the wall. A film version of The Wall was released in 1982 entitled Pink Floyd The Wall, directed by Alan Parker and starring Bob Geldof. The screenplay was written by Roger Waters. The film features music from the original album, much of which was re-recorded by the band with additional orchestration, some with minor lyrical and musical changes. It also includes the two part song "When the Tigers Broke Free", written for the movie. There were a couple of non-Pink Floyd songs featured in the film. The classic Vera Lynn song "The Little Boy That Santa Claus Forgot" opened the film, while Pink sang the words to the then-unreleased Roger Waters solo song "5:11AM (The Moment of Clarity)" (which would eventually see release on Waters' 1984 solo album The Pros and Cons of Hitch Hiking) in a restroom stall before singing the Pink Floyd song "Stop". Pink could also be heard singing a little bit of "Your Possible Pasts", which will appear in the album The Final Cut, before going into "5:11AM (The Moment of Clarity)" and then "Stop"
When the teacher finds Pink's poetry and reads it aloud, the lyrics are from the song "Money," from the Dark Side of the Moon album. During the scene where Pink finds his father's items during the second part of "When the Tigers Broke Free", Pink stumbled on his father's certificate of appreciation. The name on the certificate says "J.A. Pinkerton". It is assumed that Pink's real name is Floyd Pinkerton, and that Pink legally changed his name to Pink Floyd because he didn't like the name Floyd Pinkerton (the same way as Elton John changed his name from Reginald Dwight; Elton has stated in interviews that he hated his birth name since he was a child). Waters has licensed the story and music for a number of amateur dramatic versions performed by schools and youth groups. In 2004, it was announced that contracts had been signed for a Broadway musical version, with extra music to be written by Waters. The Broadway version will feature all of the music written by Waters. It is, however, unknown what will be done with the songs co-written by Gilmour ("Young Lust", "Comfortably Numb", and "Run Like Hell"). The show is estimated to be complete by summer 2006 and will be of a slightly "lighter tone" than Pink Floyd: The Wall was. Additionally, there are rumours that other Pink Floyd songs, possibly "Money" from the album Dark Side of the Moon, among others, will be included in the stage show. After Waters left the band, a legal battle ensued over the rights to the name "Pink Floyd" and its material. In the end, Waters retained the right to use The Wall and its material, as his name has been most closely associated with the album. Waters staged a gigantic concert performance of The Wall (with the addition of the song "The Tide Is Turning (After Live Aid)" from Waters' solo album Radio K.A.O.S.) at Potsdamer Platz in Berlin on 21 July 1990, with guest artists including Ute Lemper, The Band, Van Morrison, Sinéad O'Connor, Cyndi Lauper, Marianne Faithfull, The Scorpions, Joni Mitchell, Jerry Hall, and Bryan Adams, to commemorate the fall of the Berlin Wall and as a fundraising effort for World War Memorial Fund for Disaster Relief. At the UK Live 8 benefit concert on 2 July 2005, despite continued enmity between the former band members, Waters performed on stage with Gilmour, Mason and Wright for the first time in about 25 years, their last performance together being at The Wall concerts. Their set included "Breathe", "Money", "Wish You Were Here" and "Comfortably Numb". This album used several personnel and session musicians; many uncredited. This list is a work in progress from various online sources and interviews. Lee Ritenour — Guitar on "One Of My Turns" and "Comfortably Numb"
Freddie Mandell — Hammond Organ on "In The Flesh?" and "In The Flesh"
Ron di Blasi — Classical guitar on Is There Anybody Out There? The Happiest Days Of Our Lives: After "…hurt the children anyway they could…", one can hear an "OOF!" of someone being hit in the background. "Congratulations, You have just discovered the secret message. Please send your answers to 'Old Pink', Care of 'The Funny Farm', Chalfonte…" Roger Waters […interrupted by engineer James Guthrie who says…] "Roger, Caroline's on the phone…"
It is supposed to make a reference to Pink Floyd's previous album 'Animals'. Brixton Town Hall and Stockwell Road are both in South London, and in areas with large black populations. It also mentions Lambeth Road, Vauxhall Bridge and Westminster, which fit, if we move north from Brixton, crossing the Thames at Vauxhall Bridge. What was implied is unclear. The beginning and end of the album features a continuity; perhaps the most famous tape loop. Outside the Wall: "Isn't this where…" In the Flesh? : "…we came in?"